We have been digging into these issues and have identified the root cause. 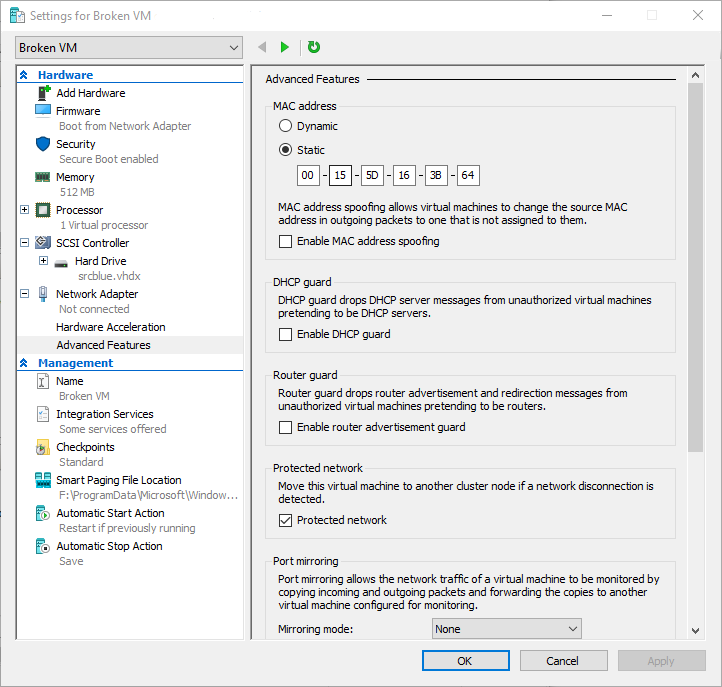 In Windows Server 2019 we made several changes to the virtual machine firmware (a topic that I plan to blog about another day). In the process we unfortunately exposed a bug. The effect of the bug is that the firmware state on a version 5.0, Generation 2 virtual machine from Windows Server 2012 R2 cannot boot on Windows Server 2019. Specifically – the bug is exposed by the IPv6 boot data that is stored in the firmware of a Generation 2 virtual machine. Note, this will not effect Generation 1 virtual machines. We are actively working on a fix for this issue right now. In the meantime, it is possible to work around this. To get the virtual machine to boot you need to get Hyper-V to create new firmware entries for the IPv6 boot data. The easiest way to do this is to change the MAC addresses on any network adapters connected to the affected virtual machine. This process is different for virtual machines with dynamic and static MAC addresses. I have also put together the following PowerShell snippet for people who like to automate things. This script will go through all network adapters on a virtual machine, find the ones with static MAC addresses, and increment them by 100. The reason why I chose to increment by 100 was incase people have consecutive MAC addresses. If your virtual machine is using dynamic MAC addresses – it is possible that you will not hit this problem at all. There are a number of cases where Hyper-V will regenerate the MAC address automatically. You can also force Hyper-V to regenerate dynamic MAC addresses by changing the dynamic MAC address pool range used by Hyper-V. Dimitris Tonias has written a great article on how to configure this that you should review. One interesting note to make here – when you live migrate a virtual machine it does not boot through the firmware. This means that if you live migrate a virtual machine from Windows Server 2012 R2 to Windows Server 2019 it will continue to run. However it will not boot if you shut it down and try to start it again after the migration. In this situation the above work around will also address the problem. My apologies to anyone who has been affected by this issue. hopefully we will have a fix out for this out soon! I had this happen to me when I first attempting moving to Storage Spaces Direct back in October. I decided to postpone going straight to Server 2019, as I didn’t know a workaround at the time. I ended up setting up S2D with Server 2016. While my VMs were on Server 2016, I updated the VM configuration version to 8.0. Two weekends ago, I migrated all of the VMs off of my S2D cluster and rebuilt with Server 2019 – don’t ask as its a long story. Now that I’ve migrated all of the VMs back on to the rebuilt cluster under WS2019, I still ran into this situation. Your workaround worked for one of the VMs. My question is: What about Linux VMs which don’t like changing MAC addresses and other Windows VMs that run software which licenses with the MAC Address. ie. ShoreTel? I’m guessing I will need to bring them online after having changed the MAC address and then shutting them down and reverting back to the original MAC address. Just curious what your thoughts on the subject is. Thx! It doesn’t appear to be, however is there any link between this and Event 18550? These are VMs that will boot but will continuously reboot. Benjamin – I have been testing a migration from Win2K12R2 for Gen2 VM’s to Win2K19 and have encountered this bug. We have a few VMs that have to have Static MAC’s due to the software on them is licensed to the MAC. It’s a big headache to relicense, thus the option to just change the Static MAC is not ideal. I unfortunately have not found any sequence to have it allow and boot using the pre-migration Static MAC (switching to dynamic and back, switching to different static and back, removing network adapter and re-adding, etc). Everytime I switch it back to the original, it won’t boot. We are actively hitting this bug. Is there a fix yet or is there a place I can check on a regular basis for a fix? Thanks!! Ben, I discovered this issue about two days after you posted this. Has there been any movement on a hotfix instead of the work around? We just dealt with this issue yesterday after a weekend migration with VM’s that were version 8 generation 2. We also tested upgrading them to version 9 configuration to see if that alone would resolve the issue and it doesn’t. Same here. I have hundreds of VMs with static MAC because they must retain their DHCP IP leases due to firewall rules. What would you or MS suggest? Re-generating every MAC, altering DHCP reservations + Firewall rules would be the work of a few days. Thanks Benjamin. Can you provide an update on this bug fix and once this bug is fixed, will Cluster Rolling Upgrade from 2012R2 to 2019 be supported? In addition to refusing to boot we have also had a handful of VMs that will cease to run. My logs are full of Hyper-V Worker events 18604, 18560, and 18570. Usually the VMs keep running but once a week or so I check the host and the VMs are in the ‘off’ state. I then have to use Ben’s workaround and then the VM can be started again. I am sad to hear that updating the VM’s configuration version will not help. Do you think that removing the existing virtual network adapter and creating a new one would be more of a permanent fix? I have the feeling that the answer will be ‘no’ and that we will all have to wait for an official fix from Microsoft.